Shadow Wood Cemetery, nestled in the heart of Spooky Hollow, boasts a growing population that enjoys an active nightlife. A pair of flickering LED “gaslight” lamps ensures that everyone finds his way home before sunrise. How many ways are there to make an LED flicker? Lots, and solutions range in complexity, from our fairly pedestrian driver circuit, to more complicated arrangements that include timer chips, logic gates, and even a programmable logic controller. As it turns out, making an LED turn on and off in a seemingly arbitrary pattern is a complex task, and the more random-looking the effect, the more you approach a Rube Goldberg device. We’re all about economy here at the skunk works, and what’s more economical than robbery? For instance, the ubiquitous flickering LED candle already contains its own flicker circuit, miniaturized and encased inside the LED. We’re going to swipe that functionality and use it to drive three Ultrabright LEDs. To accomplish this, we’ll be using the good ol’ 2N2222 NPN transistor and a handful of resistors. Well, fewer than a handful; three, to be precise. And we’re all about precision here at the skunk works; next to economy, that is. Economy and precision. Yes, that’s what we’re about. Because Homo erectus dreamed about bar-B-Q, and discovered fire. Further innovations followed, and soon we had flash lights and space shuttles. That’s not to say that Ogg, the inquisitive caveman, triumphantly waving his flaming log around, didn’t get chased out of the cave with sticks. The point being; a little technology goes a long way, and the benefits of learning something new almost always outweigh the possibility of getting chased with sticks. Call it an occupational hazard. In simplest terms, a bipolar transistor is a current-controlled device that is generally used as a switch or an amplifier. It consists of three sections called the base, the collector, and the emitter. As current increases at the base, the transistor starts to conduct electricity from the collector to the emitter. The more current at the base, the more current flows out the emitter. Decrease the base current and the emitter current decreases. This is how we’ll vary the brightness of our LEDs. Although we’re not using this type of transistor, it’s worth mentioning that a PNP transistor works completely bass-ackwards from the NPN variety. It only turns on when there is no current at the base, and current flows from the emitter to the collector. Where the NPN transistor is triggered by a high signal, the PNP is triggered by a low signal (ground). In both transistor types, a small amount of current can be used to switch a larger amount of current, which is exactly what we’re doing. Current reaches the base of the 2N2222 transistor through the flicker LED. The amount of current is varied by the LED’s internal circuitry. When the flicker LED reduces the current at the base, less current flows out the emitter, and the ultra-bright LEDs grow dim. When the flicker LED allows more current through to the base, an increase in emitter current causes the ultra-brights to grow brighter. Our flickery little flap-happy runs on 12VDC, which is fairly easy to come by. We power ours with a recycled low voltage landscape light transformer. Mount one or two of these guys inside a lantern, hurricane lamp, or that beat up solar “garden light” you’ve been saving in a box out in the garage. If your lamp’s globe is clear glass or plastic, lightly mist with white spray paint to act as a diffuser. This would look pretty cool behind a “Fresnel Globe”. Anything that’s invented between when you’re 15 and 35 is new and exciting and revolutionary and you can probably get a career in it. Anything invented after you’re 35 is against the natural order of things. I’m fond of the LED candle amplifier project, and I encourage anyone who likes to sling solder to give it a go. All you really need is patience, time, meticulous attention to detail, and a decent insurance policy. Or if what you really want is just stuff that works, order a few dozen of these. Shove a bunch of LEDs into a can, then watch Ohm’s Law and Murphy’s Law duke it out. Safely lighting our outdoor haunt has always been a compromise game. Every spotlight comes with an extension cord, and those routes have to be planned because haunt visitors are like free range chickens, or BBs. They run all over. Keeping the electrified snakes from attacking our chickens is a key responsibility that we don’t take lightly. In an effort to reduce the snake population, we investigated other lighting options and came up with what seemed to be a viable alternative: Low voltage landscape lighting. Specifically, we built an assortment of LED spots, powered by a 12V 350W transformer over 12AWG low voltage power cable. Because the cable carries 12V DC current, it can be safely “tucked” an inch or so beneath the soil with just a spade. Each lamp consists of a cluster of LED Christmas lights housed in a length of two-inch diameter PVC pipe, which is sealed and mounted to a post. The positive and negative leads are attached with wire nuts to a low voltage wire connector. The best part of this arrangement is that the connector can be attached to the power bus at any point along its length, allowing for greater flexibility in the layout of our lighting plan. With fewer extension cords lying about, there are fewer opportunities for “unplanned interactions” between them and our guests. All we had to do was keep our chickens from tripping over the lamps. The basic idea is to pack as many LEDs as possible into the can without setting any fires. The not setting any fires part requires that we understand a few key concepts. For example, why would I wire three or four LEDs in series, and then connect three or four of these series circuits together in parallel? If you know the answer, then you can go outside and play while the rest of the class catches up. It is usually at this point in a dissertation on LEDs that the author devotes several paragraphs to a review of Ohm’s Law. Instead of heading off into those weeds, we’re going to wade through some other weeds. We’ll tackle the math as we go. In the most general terms, a circuit is designed to operate at a particular voltage, and will draw as much current as it needs. An LED requires a certain minimal current to turn on. The “forward voltage” is the least amount of voltage required to allow current to flow through the LED. The amount of current changes (exponentially) based on the amount of voltage that is applied. A small increase in voltage results in a large increase in current. The more current, the brighter the light. That is, until it overheats and dies. There are two species of LED Christmas lights. One type consists of red, orange, yellow, green, and blue LEDs. The other type utilizes only a white LED encased in a colored plastic sheath or bulb. It’s important to know the difference because the latter type provides a simpler solution for our application. All the LEDs have the same power requirement: About 2V(forward), and about 3V(optimal), drawing about 20mA. For simplicity’s sake we’ll be discussing this type of LED. Note: I had a zillion of the colored LEDs and no data sheet, which meant I had to employ my unpaid assistants, Trial and Error, to determine the power requirements for each color. I should mention that Trial was generally cautious during testing while Error ham-handedly blew through not a few LEDs. Think of voltage as a sluice gate above a water wheel. Say the gate is marked with stops, 1-12, that represent voltage. Open the gate to 1 and a trickle of water flows over the wheel, but it’s not enough to make it turn. Open the gate further to 2 and the wheel begins to turn. We’re at forward voltage, meaning the LED is on, but just barely. We need to apply more voltage (to get more current to flow) for it to glow more brightly. Open the gate to 3 and now there’s enough power to grind some corn. We’re at optimal voltage and the LED glows at the brightness for which it was designed. If you go all the way to 12, then you, or the passive-aggressive engineer who built the gate, must have a grudge against the miller. Like the wheel about to fly off its axle, when you over-energize an LED, it may glow very brightly for a short period of time, but it’s toast. An LED is polarized, meaning it has a positive lead(anode) and a negative lead(cathode). To wire two LEDs in series, connect the positive side of one to the negative side of the other. Note: Always connect the anode to the positive side of the voltage source, and the cathode to the negative side of the voltage source. How many LEDs can safely be connected in series? Simply add up the voltage requirement for each LED until you reach source voltage (12V in this case). Assuming 3V(20mA) for each LED, the answer is four (3V+3V+3V+3V=12V). This series circuit can handle 12V, and would draw 20mA. Three goes into 12 four times, which is nice. But suppose your LEDs can’t handle 3V, and instead prefer 2.5V. In that case, how do you get to an even number of LEDs? You can place 5 LEDs in series. Each LED would get 2.4V (12V / 5 = 2.4V), instead of 2.5V, which means they’ll be a little dimmer. But it might not be enough of a difference for you to notice. Then again, they might be a lot dimmer, in which case you’re on to your second option. Place four LEDs in series. Since these four LEDs would only require 10V (2.5V * 4 = 10V), you need to drop the extra two volts with a resistor. The resistor value can be calculated with Ohm’s Law as R = V / I. If each LED requires 20mA (.02A), then the resistor value would be 100Ω. (2V / .02A = 100Ω) So, you would add a 100Ω resistor at one end of your series circuit to deal with that extra two volts. Don’t. You saw what happened to the miller. Four LED Christmas lights don’t emit much light, and we’ve determined that we can’t add more LEDs to our series circuit, so how do we pack more light into our lamp? Simple. 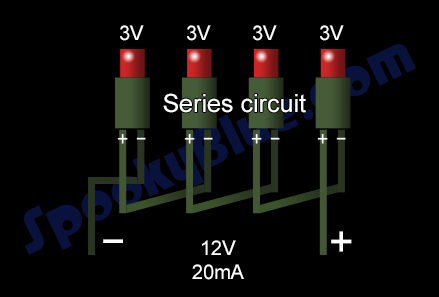 Build four series circuits, then wire those together in parallel. At the end of each series circuit is a lead. One is positive, the other is negative. Connect the positive leads, connect the negative leads, and you now have a cluster. Each series circuit draws 20mA, so the cluster would draw a total of 80mA. How many series circuits can be wired together in parallel to form a cluster? That depends on how much current your power supply can provide, and how good you are at packing everything together inside its container. Our 12V transformer is rated at 350W. To figure the total amount of current I can draw from the transformer, [I(Amps) = P(Watts) / V(Volts)] Therefore, 350W/12V = 29A, or 29,000mA. Our transformer could, theoretically, provide current for roughly 362 clusters (80mA * 362 = 28,960mA). That’s assuming, of course, that our power bus is a superconductor, or a spherical chicken in a vacuum. It’s neither, so voltage losses in the power cable would probably be a limiting factor. Still, you could pile on a lot of lamps without worrying about the transformer bursting into flames. How to build a 12V LED lamp. I know what you’re thinking. We’re two articles into this project (if you count the introduction), and we haven’t yet glued anything to the workbench (silicone sealant is surprisingly adhesive) or accidentally hurled a hunk of PVC across the room (off the table saw, and I’m extremely lucky to still have two ears). I figured it was a good idea to cover the more arcane aspects of the project first. With these out of the way, the rest of the construction is a snap. Snug Harbor’s Christmas display got an upgrade last year when we switched to LED lights. It was a no-brainer, from a technical standpoint. Two strands of LEDs replaced a dozen strands of incandescent bulbs, minimizing potential failure points (i.e. those tiny little fuses housed in the plug), and removing all but one extension cord. Your ol’ pal Spook isn’t a fan of hanging from the roof gables, and devoted readers know my general opinion of Christmas lights; they want to kill you. The less time I’m forced to devote to electrical engineering while poised forty feet in the air, the better. This, more than the energy savings, was the main selling point for me. After not getting killed, I climbed down the ladder and went to the middle of the yard to survey my work. The day had been warm, but it was chilly now as the sun wandered off into the trees. The early evening had grown quiet as mothers called kids in for supper, steadily emptying yards up and down the street. I stood alone in my yard, looking up at our new LED Christmas lights, and it was a significantly disappointing moment in my life. The words “glow” and “glare” are considered synonyms, but only in the sense that they both mean “radiate”. Instead of glowing warmly with the happy blush of electric gingerbread, Snug Harbor glared. And it glared coldly. With a perceptible seizure-inducing 60 Hertz flicker, its harsh blue-green aura had all the charm of a florescent light scowling over a meat locker. Oh, those lights were ugly. But needs must when the devil drives, so I left them up. And that’s the story of how Shadow Wood came into a wealth of outdoor LED lights to hack the following season. 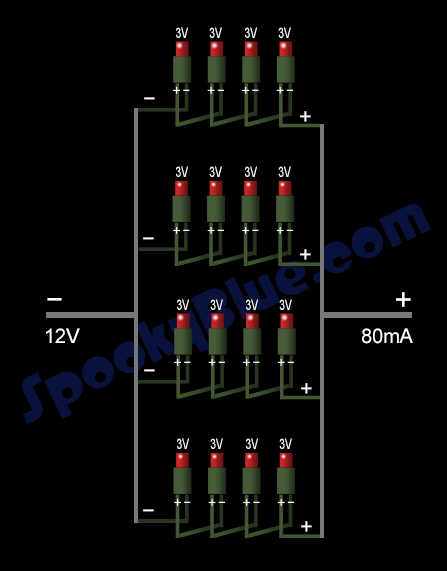 In Part II of this series, “Light your haunt with hacked LED Christmas lights“, or “I told you that story to tell you this one”, we’ll step through all the fiddly bits, discuss how to re-purpose a 12V low-voltage transformer to power the fiddly bits, and explore the reasons why this project is probably a bad idea.